Tim and Casey Teirnan were out for a walk when they spotted what they first thought was a loose dog near the 5900 block of Vickery Boulevard. "We thought it was a dog and then it hopped and it was unmistakable that it was not a dog and I said, 'Oh my god, that's a kangaroo!'" Tim Tiernan recalled. It turned out to be a wallaby. "It's just another day in the life of Lakewood," Casey Teirnan said. The animal, later identifed as Muggsy, was taken to Dallas Animal Services and reunited with his owner. A spokesperson for Dallas Animal Services says Muggsy's owner is visiting Dallas from Oklahoma. The animal was in a backyard nearby when he escaped though a hole in the fence. Muggsy was reuinted with his owner, who wasn't identified. In a comment on Facebook, DAS says Muggsy "spends most of his time on a ranch in the country where he has space to explore." 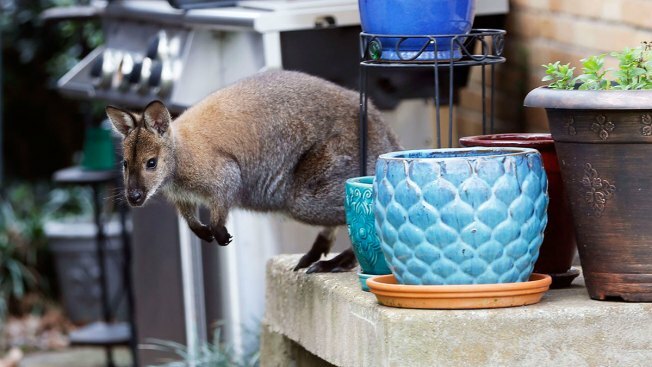 It is legal to own a wallaby in Dallas as long as you have a proper permit.